TIM TEBOW is a two-time national champion, first round NFL draft pick, and Heisman trophy winner. Tim Tebow is currently signed to play professional baseball with the New York Mets and is a college football analyst for the SEC Network. Prior to joining the SEC Network, Tebow played three years in the NFL for the Denver Broncos, New York Jets and New England Patriots. In 2011, Tebow was the first quarterback featured in ESPN’s “Year of the Quarterback” series. He later released “Through My Eyes”, which was named the #1 sports book of 2011 and the bestselling religion book of 2011. Tim will be releasing a new book this October, “Shaken: Discovering Your True Identity in the Midst of Life’s Storms” (WaterBrook). Tebow also contributes to a variety of ESPN platforms including SportsCenter, ESPN Radio, and the network’s Heisman Trophy coverage. 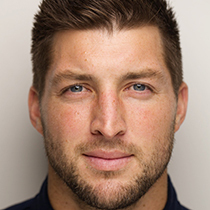 He is active in a variety of philanthropic activities through his Tim Tebow Foundation.